It doesn’t rust and produces hardly any brake dust. 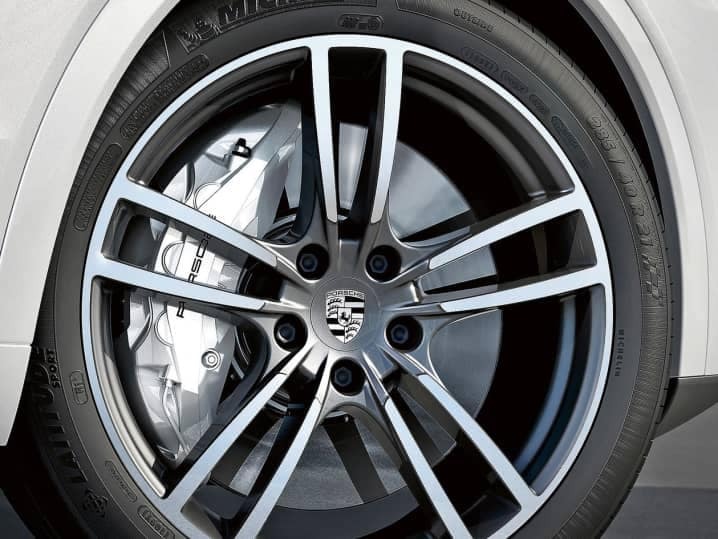 The Porsche Surface Coated Brake (PSCB) will debut as a standard feature of the new CayenneTurbo. 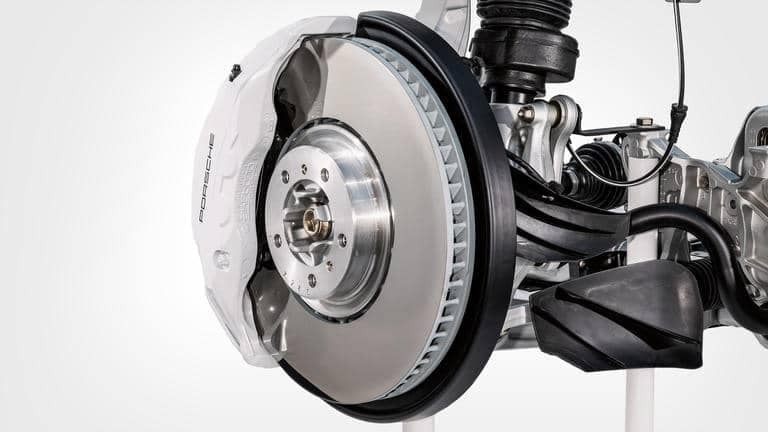 The Porsche Surface Coated Brake (PSCB), which is celebrating its debut as a standard feature in the new PorscheCayenneTurbo, is nothing less than a worldwide first. Its surface consists of tungsten carbide (chemical formula: WC). Tungsten and carbon form a mixed crystal so hard that it can be used to cut glass. Tungsten carbide is one of the hardest materials in the world after diamond, and around ten times harder than gray cast iron—which is precisely what makes it so interesting to brake engineers. Matthias Leber: head of the brake division and the mastermind behind the PSCB. “The result surprised us all,” says Leber. “We already knew that the brake would be good, but the first tests exceeded all our expectations.” Thanks to the smooth surface, the full pad immediately starts covering the disc at low speeds. You could compare it to the difference between a vinyl record and a CD: unlike gray iron, tungsten carbide has hardly any grooves and is smooth as a mirror, so there are no hollows to reduce the total amount of surface area. When greater stopping power is needed at high speeds, the hard components of the pad throw out their microscopic anchors. “That, of course, means wear and tear,” says Leber. “It also means brake dust, but 90 percent less than what you’d get with a gray-iron brake.” Moreover, the tungsten carbide discs have a service life 30 percent longer than their gray-iron counterparts. This puts their performance levels close to those of the PCCB, but at only one-third of the cost of the ceramic brakes. And the new brakes feel like the PCCB in practice. The pedal force remains constant, even when the brakes are hot. These brakes don’t show the dreaded fading behavior at high temperatures. On the contrary, they work all the more crisply at temperatures above 1,112 degrees Fahrenheit. 1) Thermally treated surface: lasers structure, abrade, and clean the gray-iron core. 2) Ductile interlayer: nickel applied in a galvanic process helps bind the gray iron and tungsten carbide. 3) Hard-metal coating: this consists of tungsten carbide, flame-sprayed on at high velocity. 4) Brake disc and caliper: coated lightweight gray-iron brake disc with a ten-piston fixed caliper. 5) PSCB brake pads: they have a newly developed special material. After around 375 miles of normal use, the brake pads have polished the surface of the disc to a shine. Their color then matches the white ten-piston fixed calipers in the front and the four-piston fixed calipers in the rear, whose technology is familiar from the PCCB. But why white? Leber laughs. “If a brake produces practically no dust, you want to advertise that fact. My color proposal met with a lot of initial resistance.” But after thousands of miles, the brakes on the new PorscheCayenne test vehicles are still clean as a whistle. The PSCB will start as standard equipment only in the new CayenneTurbo. It’s available as an option for all other new Cayenne models. Is the PSCB the perfect combination of performance, aesthetics, and cost effectiveness—and thus the holy grail of brake development? Leber shakes his head. 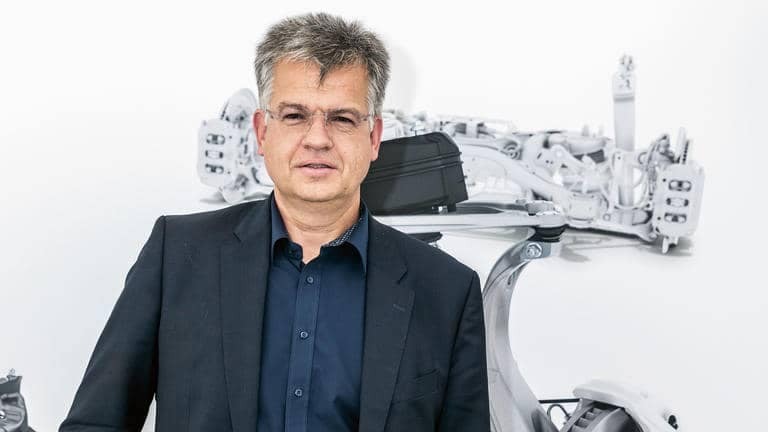 “As electrification makes ever greater advances in automotive engineering, it’ll also bring new types of brakes. Recuperation, for example, is a completely non-wear type of deceleration, which makes it all the more interesting, because at some point we’ll be able to use it for 90 percent of all standard braking action. We have to keep working on it.” After all, fast cars need fast brakes. So Porsche brakes can never be fast enough.